E. Rafter and Susan Pew, who later sold it to T. B. Davis who reorganized it under the name of the Blaine Mining Company. In 1903, anthracite operators from Bethlehem, Pennsylvania, the Weston-Dodson Company, opened a mine under the name of the Garrett County Coal Company. Operations in the Dodson area ceased in 1930. 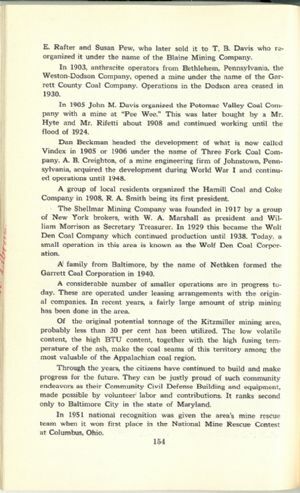 In 1905 John M. Davis organized the Potomac Valley Coal Company with a mine at "Pee Wee." This was later bought by a Mr. Hyte and Mr. Rifetti about 1908 and continued working until the flood of 1924. Dan Beckman headed the development of what is now called Vindex in 1905 or 1906 under the name of Three Fork Coal Company. A. B. Creighton, of a mine engineering firm of Johnstown, Pennsylvania, acquired the development during World War I and continued operations until 1948. A family from Baltimore, by the name of Nethken formed the Garrett Coal Corporation in 1940. A considerable number of smaller operations are in progress today. These are operated under leasing arrangements with the original companies. In recent years, a fairly large amount of strip mining has been done in the area. Of the original potential tonnage of the Kitzmiller mining area, probably less than 30 per cent has been utilized. The low volatile content, the high BTU content, together with the high fusing temperature of the ash, make the coal seams of this territory among the most valuable of the Appalachian coal region. Through the years, the citizens have continued to build and make progress for the future. They can be justly proud of such community endeavors as their Community Civil Defense Building and equipment, made possible by volunteer' labor and contributions. It ranks second only to Baltimore City in the state of Maryland. In 1951 national recognition was given the area's mine rescue team when it won first place in the National Mine Rescue Contest at Columbus, Ohio.